Agar or agar-agar is a jelly-like substance, obtained from algae. It was discovered in the late 1650s or early 1660s by Mino Tarōzaemon (美濃 太郎左衛門) in Japan, where it is called kanten. Agar is derived from the polysaccharide agarose, which forms the supporting structure in the cell walls of certain species of algae, and which is released on boiling. These algae are known as agarophytes and belong to the Rhodophyta (red algae) phylum. Agar is actually the resulting mixture of two components: the linear polysaccharide agarose, and a heterogeneous mixture of smaller molecules called agaropectin. Throughout history into modern times, agar has been chiefly used as an ingredient in desserts throughout Asia and also as a solid substrate to contain culture media for microbiological work. Agar (agar-agar) can be used as a laxative, an appetite suppressant, a vegetarian substitute for gelatin, a thickener for soups, in fruit preserves, ice cream, and other desserts, as a clarifying agent in brewing, and for sizing paper and fabrics. The gelling agent in agar is an unbranched polysaccharide obtained from the cell walls of some species of red algae, primarily from the genera Gelidium and Gracilaria. For commercial purposes, it is derived primarily from Gelidium amansii. In chemical terms, agar is a polymer made up of subunits of the sugar galactose. Agar was first used in microbiology in 1882 by the German microbiologist Walther Hesse, an assistant working in Robert Koch's laboratory, on the suggestion of his wife Angelina Fannie Eilshemius Hesse. He discovered that it was more useful as a solidifying agent than gelatin, due to its better solidifying temperature. The solidification of the agar within any growth media (GM) is pH-dependent, with an optimal range between 5.4-5.7. Usually, the application of KOH is needed to increase the pH to this range. A general guideline is about 600 µl 0.1M KOH per 250 ml GM. This entire mixture can be sterilized using the liquid cycle of an autoclave. Agar-agar is approximately 80% fiber, so it can serve as an intestinal regulator. Its bulk quality is behind one of the latest fad diets in Asia, the kanten (the Japanese word for agar-agar) diet. Once ingested, kanten triples in size and absorbs water. This results in the consumers feeling fuller. This diet has recently received some press coverage in the United States as well. The diet has shown promise in obesity studies. 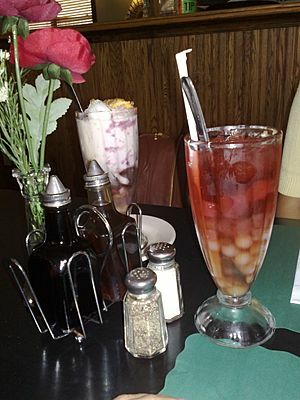 In Vietnamese cuisine, jellies made of flavored layers of agar agar, called thạch, are a popular dessert, and are often made in ornate molds for special occasions. In Indian cuisine, agar agar is known as "China grass" and is used for making desserts. In Burmese cuisine, a sweet jelly known as kyauk kyaw (ေကျာက်ေကြာ) [tɕaʊʔtɕɔ́]) is made from agar. Agar Facts for Kids. Kiddle Encyclopedia.